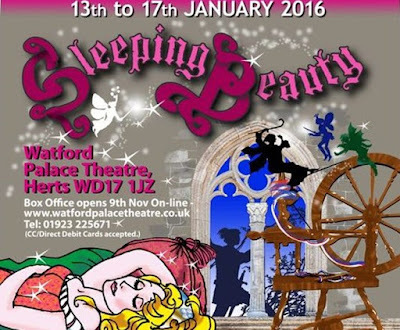 13th January 2016: It's time for yet another pantomime, but this time it is turn of BACCES. Who on earth are BACCES I hear you shout? Well it's the British Airways Cabin Crew Entertainment Society, and every year, they put on a panto to raise money for charity... and they do a splendid job in doing so. Not only do they take time out of their busy schedules to put on a show, but they also take the time to rehearse every week, and that is no mean feat when they are all over the world at different times. It was formed way back in 1971, and is still going strong today. And this years offering is full of laughs and some good performances. Sleeping Beauty is set in the Land of Nod, and there are all sorts of characters mixed in to the fray, from Steven Warner's amiable Baron Brain, to Nick Young doing a grand job as Lord Lance de Boil, smatterings of Fagin from Oliver often bursting in. 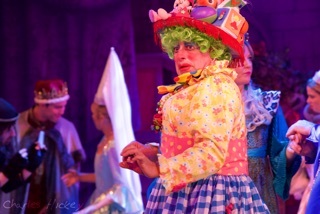 Lesley Dickinson does a great job as scatterbrained Dusty Springclean, and no panto is without it's dame, in this case it's the outrageous Nanny McNophee played by Richard Hickman. The main love interest aka Sleeping Beauty/Princess Harmony, is played by the very likeable Luci Bowditch who sings and dances with gusto. 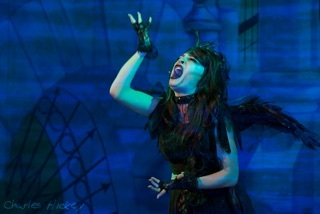 But for me, the standout performer in this show is Collette Lucas as Maleficent the bad witch. Every panto has it's baddie, and Collette is simply brilliant with her mannerisms, evil laugh and dazzling vocal display. The ensemble do a fine job indeed. Slick choreography adds a little razzmatazz to proceedings which is well needed as sometimes the dialogue in the show seems to drag, especially when the jokes are coming thick and slow - there's only so many times I can put up with hearing the drums doing a badum-tish, but after nearly every joke it becomes a bit of a snore, no wonder Beauty is asleep for all those years! The production team have done a good job, with nice lighting from Jonathan Haynes adding sparkle to the usual array of front cloths and limited set, and the band are doing their best even though it is a little quiet in places and difficult to hear at times. Add in to the mix the usual UV scenes and a panto song at the end along with a grand finale, this is a fun family show. All in all though, for an amateur company doing their bit for charity every year, they put in a great amount of effort and enthusiasm and I look forward to seeing what they have to offer next year.